***BONUS NEWS: The podcast I was on (along with Sage Clegg) just before the hike went well over 20,000 downloads this weekend, cool! If you missed it, I have it linked along the left side margin of my blog or you can click here. 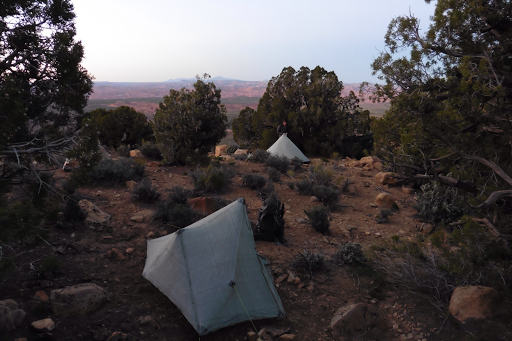 It’s called Trailside and host Ratatouille will continue posting weekly as he starts the PCT soon. My internal alarm had me up just before 6am, but I gloriously laid in the BED of COMFORT until 6:30am when my sister called for an early morning Skype with my nephews. Both Katherine and Gavin had resupplies, chores, and packages missing, so I stayed at the motel getting my little chores done in my room and headed out at 9am to then spend the rest of the time at the library computers until Katherine was ready to go. I packed up, checked out of the motel, got a quick ride down the street to buy a few things, and then saw Gavin who told me the library didn’t open til 3pm, dang it! I walked back to the motel and was fortunately able to get my room back. The Circle D Motel rocks! I got something to eat at the attached restaurant (Escalante has excellent food!) and then took the next couple hours in my room getting Internet things done. Most exciting is that I ordered new flip flops that I’ll get in a couple weeks. I left mine at a campsite the second week in trail of course! Wifi was great at the hotel with all the guests checked out, but doing emails, logistics, and website stuff is painstakingly slow on an iPhone keypad. I love all your comments and emails, but understandably can’t reply to all of them at length as much as I have on other trails. This remoteness and small towns are part of the draw for people on the Hayduke for sure and it’s great…if you aren’t maintaining a blog, ha! Around 1pm, Katherine was set to go. I was sooo close to finishing my emails and technical organizing and wouldn’t have minded even if it took her a couple hours more since I have not gotten the TV time I’ve been hoping for thus far, ha! We walked down the road, did a couple more errands, and got our supposed last real meal for 9 days! Salad and a $5 chocolate torte I’d been eyeing for the past 24hrs. Worth it!!! We walked toward the gas station at the end of the ~1.5m stretch of town to attempt to hitch. We saw Hayduker Freebird who we met in Hanksville a week or so ago. He had just come into town and is staying the night. Again, I didn’t think to get a picture. Now about 2:30pm…Our packs fully loaded and the traffic headed out to the trails very low. Our goal was to go the 5-10mi to where the paved highway split with the more remote Hole In The Rock Road. We figured we could at least get there and if we couldn’t get the ~25mi hitch to the trail, we could easily hitch back to town if needed. The gas station just happened to have a Subway inside, so we just had to get some subs for the road. After trying for 15mins, I went back in the gas station to make a sign in hopes that it would help. It sorta did help because the guy in line next to me offered to give us a ride even though he wasn’t headed that direction. A hitch in a big utility van that he also had converted to include a kitchen and bathroom. Works for us! 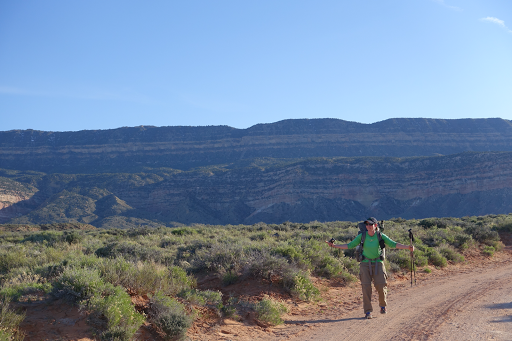 We finally got to the intersection of Hole In The Rock Road and now was the difficult part. 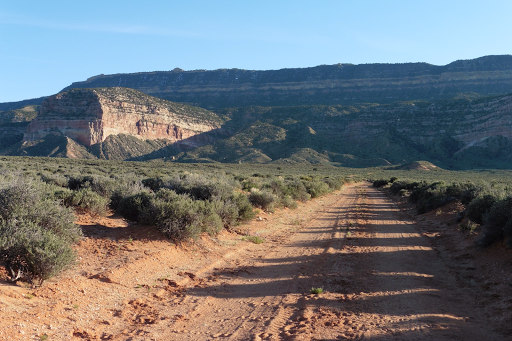 We needed someone to be driving about 25mi down this washboard road on a Monday late afternoon….after waiting 1.5hrs (some of which I was able to write the first half of this blog entry!) and talking to probably a dozen cars that turned to go down the road, but were not headed that far, we got a ride! Thank you to Maria and Chuck who were out sightseeing and from California. After what felt like quite a long day, we were finally hiking. Both carrying what will hopefully be 9 days of food that I don’t want to stretch to 10 days….Katherine has filled her ULA Catalyst (she greatly misses her much tinier and lighter ZPacks ArcBlast) to the brim with plenty of bulky food that makes it seem much larger than it really weighs. Cracks us up though. She calculated that it’s probably about 42lbs. She also brought a gallon container of water that she drank most of waiting for the hitch. 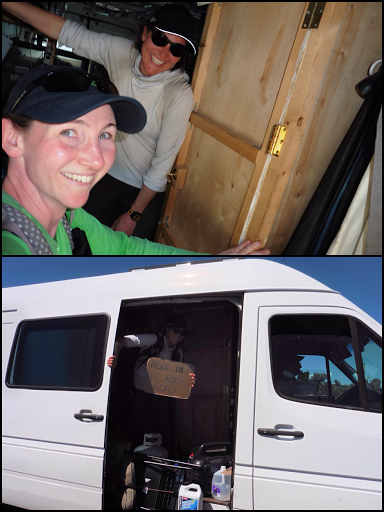 The container is now empty, but will be used as her strategy for carrying water when we have two 30mi dry stretches this leg that might mean almost two full days of hiking with slow terrain ahead. The first of those stretches will start tomorrow mid morning when we hit a water source. Katherine drinks lots of water, so she’s ready to carry what she needs. More details on that water carry tomorrow. Just to give an idea of size, Katherine is 5′ 10″. It would be hilarious if I put her pack on! 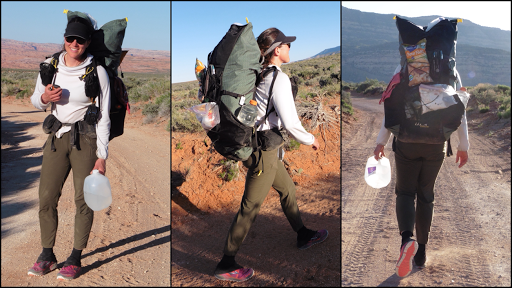 It’s the bags of cheese puffs and Fritos that really give it that thru hiker flare. 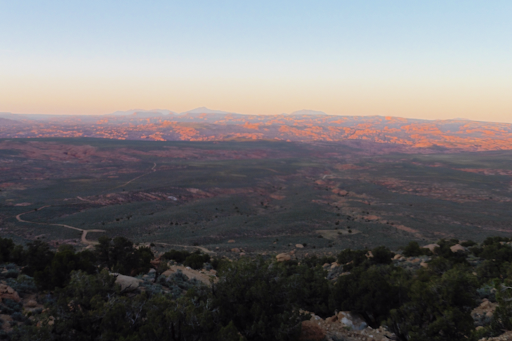 We hiked the dirt road trail til 7:45pm, which was only about 3mi, but got us a good chunk into the ~2500ft climb over Fifty Mile Bench, which is like this huge flat topped mountain that extends for 50mi that we’ve seen since getting to the top of Waterpocket Fold a few days ago. We are camped most the way up the ridge just left of the road. We have a nice sheltered campsite with a great view that looks back as far as the Henrys. 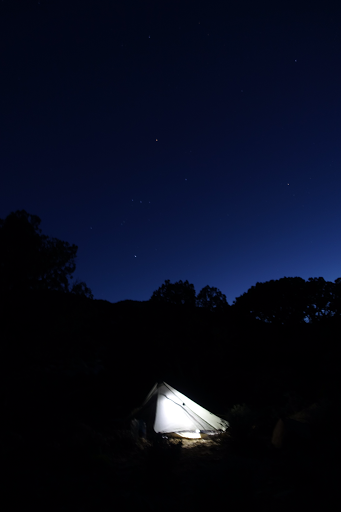 The stars are great and Katherine got a nice shot of my tent. So…little hiking today, but great progress on many fronts as just getting out here during this time of day and week can be a challenge. The weather the next few days is NOT good with strong wind gusts at 50mph starting midday tomorrow into much of the next day. We are happy to be getting over the 7,000ft+ Fifty Mile Bench in the morning. In two nights, temps will drop to below freezing and snow is expected us high…we hope to be lower and hopefully less impacted by snow and or winds. Gonna be a challenging leg for sure when we add in the fact that we have 9-10 days of food and there will be lots of water to carry.